Get urgent news alerts and special reports. The news and stories that play a role, delivered everyday mornings. A military plan carrying members of Congress to the veteran John Dingell's funeral in Michigan has returned to Washington on Tuesday due to bad weather. 19659009] Missouri Rep. Billy Long tweeted that the delegation held an impromptu service at 30,000 feet for Dingell, led by rep. John Lewis of Georgia, House speaker Nancy Pelosi and Rep. Fred Upton in Michigan. 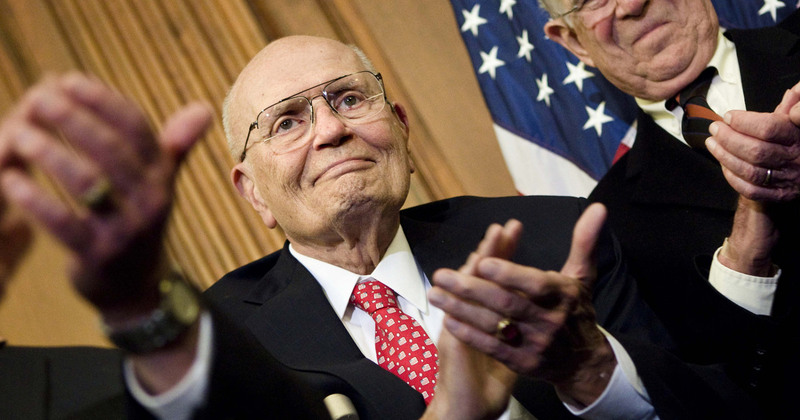 Dingell, who died on Thursday, was 92 years old. "We feel very sad," Pelosi said. "We had nearly 60 members serving our colleague, President John Dingell, but weather prevented us from landing and we had to accept the pilot's decision about it." Long and two congressional leaders said the plane had been delayed from starting and "circling there for an hour waiting for the temperature to rise one degree." He says the weather was not changing, and the delegation was now back at Joint Base Andrews in Maryland. "We had a short little service on the plane, impromptu," Rep. Fred Upton, R-Mich. "We had about 30 of us and we all held hands and John (Lewis) said a few words, and I said a few words and the speaker said a few words. We'll be back in Capitol to welcome the body when it comes later this afternoon." 19659009] Dingell's burial ground continued as planned in Dearborn. His coffin is scheduled to arrive in Washington later Tuesday and is run by the US Capitol Building, where he represented Michigan in the house for 59 years. He retired in 2014. A post is scheduled for Thursday in Washington. Dingell's widow, Rep. Debbie Dingell, serves in her former house seat.